Batman Solo Movie Coming Before Aquaman in 2018? Earlier this week, it was revealed that Ben Affleck has completed his script for the Untitled Batman Reboot, which he reportedly wrote alongside collaborator and DC legend Geoff Johns. But there hasn't been any official word on when we might see this solo adventure for Bruce Wayne. While Warner Bros. hasn't even officially announced the movie yet, Heroic Insider claims the movie might be closer than we think. There is no doubt that Batman is DC Comics most popular character. And with the bad reviews still coming out against Batman v Superman: Dawn of Justice, Warner Bros. wants to stay within the fans' good graces. They plan to do that by delivering the caped crusader in his own adventure within the next two years. 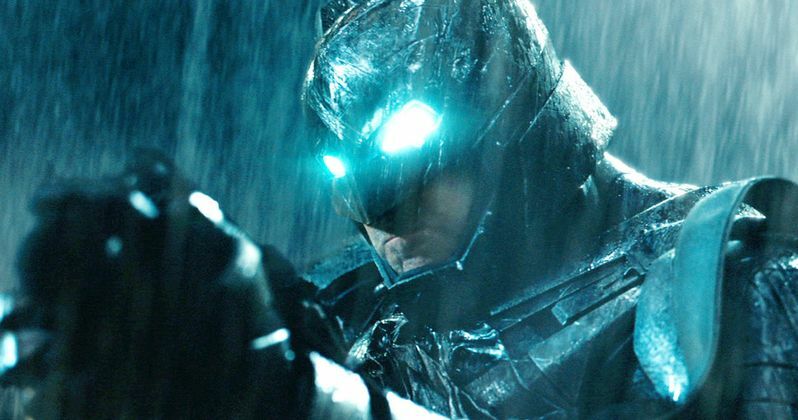 As it stands, they hope to get the Untitled Batman Reboot in theaters before Aquaman. Ben Affleck will next be seen in this summer's Suicide Squad, which gives him a cameo opposite the new Joker played by Jared Leto. It will be the first time these iconic characters interact on the big screen. The vigilante superhero will then return for a much more substantial role in Justice League Part 1, which hits theaters November 2017. Justice League Part 2 doesn't hit theaters until 2019. So 2018 leaves a big empty Batman hole that the studio is eager to fill. The Untitled Batman Reboot is apparently a top priority at Warner Bros. And the movie is said to be on the fast track. Yet, as Ben Affleck's agent revealed just this past week, the actor is currently only signed for the two Justice League movies. But that was said to likely change in the near future. The Flash solo movie is opening in the same time frame as Batman v Superman: Dawn of Justice, arriving in 2018. With Aquaman coming in the summer, we're not sure where the Untitled Batman Reboot will land. It's possible that Warner Bros. could position it as a January release. But it could also arrive as a summer movie in May. As it stands right now, DC and Warner Bros. have two DC Comics movies scheduled to open ever year until 2020. If the Untitled Batman Reboot is truly expected to arrive in the first half of 2018, then production will need to happen fairly quickly. This means we're looking at a late 2016 or very early 2017 production start date. Justice League Part 1 begins shooting April 11. Ben Affleck is also set to direct Live by Night for Warner Bros., which comes out in October, 2017. No story details have been released for the Untitled Batman Reboot, but rumors claim it will incorporate elements from the 'Under the Red Hood' storyline, which has already seen an animated adaptation. What do you think? Are you excited to see Batman flying solo so soon? Or is this way too much Batman on the big screen in the span of just three years? With more to come in the years that follow?